LOGAN — Local law enforcement officials, friends and family are mourning the death of an officer with the USU Police Department. Andy Barnes passed away Wednesday after battling complications with cancer. USU Police Chief Mike Kuehn said it was with heavy hearts that he announce the passing away of Barnes. He explained, “Andy was an amazing example of selfless love, always thinking of others and had a kind word or joke ready for his co-workers.” His quick wit, calm disposition and commitment to professionalism while working with others enabled him to easily earn the trust and respect of the USU and Cache Valley communities. 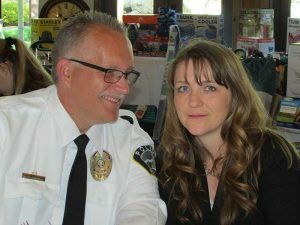 Barnes began his law enforcement career in 1992 as a volunteer member of the Cache County Sheriff’s Office Search and Rescue team. Six years later, he accepted a full-time position in the Cache County Jail. While there, he worked with inmates as a work-release coordinator, a transportation deputy and a jailer. In 2002, he was a part of the contingent of Cache County deputies, who provided security at the Snowbasin Resort during the Winter Olympic Games. Barnes joined the USU Police Department in 2009 after running his own business. Later he sold the business and enrolled as a non-traditional student at the university. Barnes was born in 1973 in Logan and raised in both Logan and Providence. He leaves behind his wife, Cathrine, and the couple’s three children: Morgan, Tanner and Emerie. Funeral services will be held Wednesday, December 19 at 11 am. They’ll be held at the LDS chapel, located at 100 West 450 North, Hyde Park. Viewings will be held the night before from 6 p.m. to 8 p.m. and from 9:30 a.m. to 10:30 a.m. before the funeral. There is a gofundme set up for his young family. Please consider helping them with a donation, especially during this time of year.